Palate: Immediate big oily arrival with buckets of soft red fruit and Glendronach-like bubblegum. Cherry, strawberry, blueberry, peach in a thick, oily coating and just when you wonder if it has more to offer than just fruit, it turns to salty/sweet liquorice and charred oak, resin, forest floor and farmy peat. With water it becomes sweeter with even more juicy summer fruit and orange cream. Then suddenly some spicy flavors kick in. Cloves, Nutmeg, Cardamom mixed with sweet barley. You can chew on it forever, it never gets dull and keeps releasing one big flavor after another. Finish: Big oaky finish with bitter orange, liquorice and woodsmoke. The creamy red fruit comes back again before leaving you with a pile of earthy ash. The best 12 year old whisky that I had so far. Excellent from nose to finish. Bought this for €42,-, an absolute steal of a deal:) Try getting a 12y CS Sherried whisky from Islay for that same money... Grab it while its there. 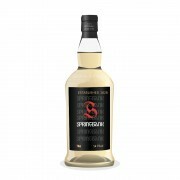 I just dont understand one thing, how could a +-70% spirit after being distilled 2,5 times end up at 50,3% after only 12 years in Scottish climate? Maybe it was the humidity level. Perhaps that favours loss of alcohol vs water. Either way, cask strength means full flavour. The amount of alcohol is less important. In fact, the lower the alcohol in a cask strength scotch, the more you can drink at one go without getting too buzzed to fully enjoy it. Picked up a bottle for $54. Good deal. On sale. Remember the age statement only means that there is no whisky under that age: a stated 3 year old could have nothing in it under 50 years old for example. So this 12 year old Springbank could include whisky of any age 12 years and over.